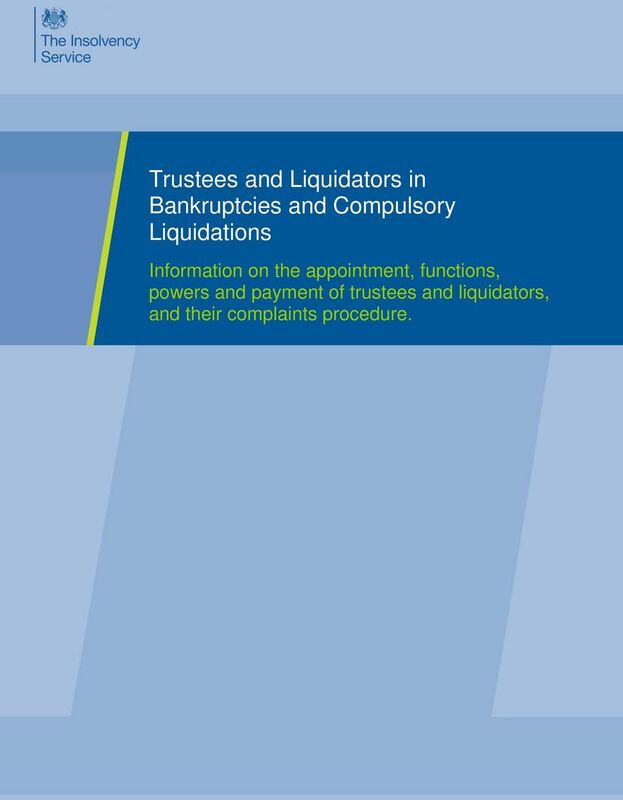 Download "Trustees and Liquidators in Bankruptcies and Compulsory Liquidations"
1 Trustees and Liquidators in Bankruptcies and Compulsory Liquidations Information on the appointment, functions, powers and payment of trustees and liquidators, and their complaints procedure. 3 Purpose of this guide This guide summarises the functions and powers of a private sector insolvency practitioner who is appointed as: trustee of a bankrupt; or liquidator of a company in compulsory liquidation. It also summarises how the practitioner is paid. Even though a private sector insolvency practitioner may be appointed, the official receiver remains responsible for investigating the affairs of the bankrupt or company. If you have any queries or information that would assist these investigations, please send them to the official receiver dealing with the case. 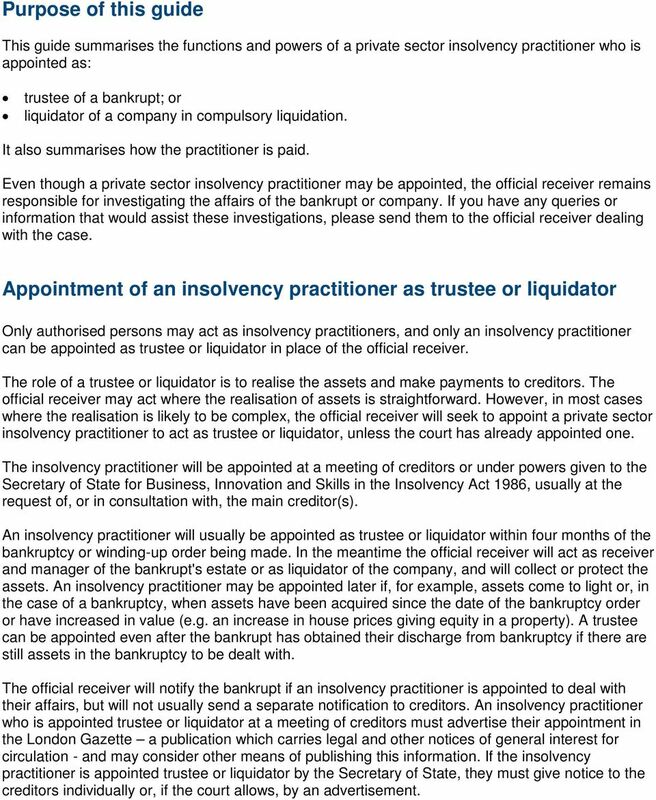 Appointment of an insolvency practitioner as trustee or liquidator Only authorised persons may act as insolvency practitioners, and only an insolvency practitioner can be appointed as trustee or liquidator in place of the official receiver. 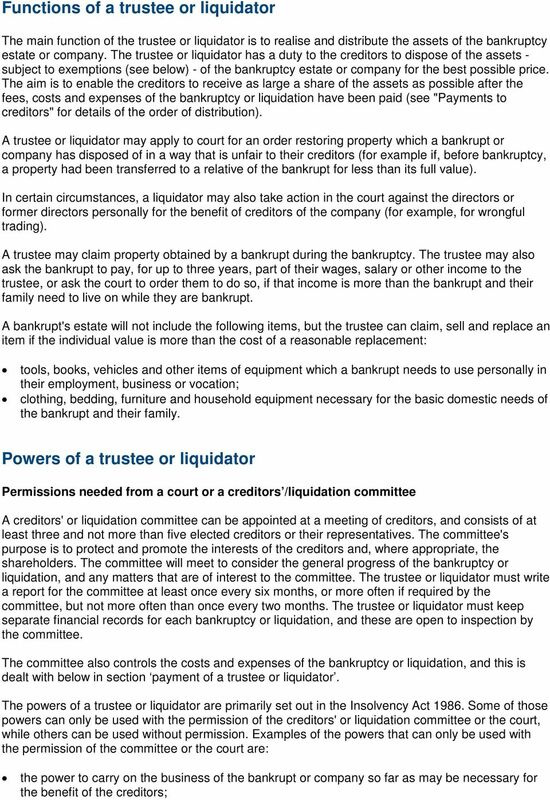 The role of a trustee or liquidator is to realise the assets and make payments to creditors. The official receiver may act where the realisation of assets is straightforward. However, in most cases where the realisation is likely to be complex, the official receiver will seek to appoint a private sector insolvency practitioner to act as trustee or liquidator, unless the court has already appointed one. The insolvency practitioner will be appointed at a meeting of creditors or under powers given to the Secretary of State for Business, Innovation and Skills in the Insolvency Act 1986, usually at the request of, or in consultation with, the main creditor(s). An insolvency practitioner will usually be appointed as trustee or liquidator within four months of the bankruptcy or winding-up order being made. In the meantime the official receiver will act as receiver and manager of the bankrupt's estate or as liquidator of the company, and will collect or protect the assets. An insolvency practitioner may be appointed later if, for example, assets come to light or, in the case of a bankruptcy, when assets have been acquired since the date of the bankruptcy order or have increased in value (e.g. an increase in house prices giving equity in a property). A trustee can be appointed even after the bankrupt has obtained their discharge from bankruptcy if there are still assets in the bankruptcy to be dealt with. The official receiver will notify the bankrupt if an insolvency practitioner is appointed to deal with their affairs, but will not usually send a separate notification to creditors. An insolvency practitioner who is appointed trustee or liquidator at a meeting of creditors must advertise their appointment in the London Gazette a publication which carries legal and other notices of general interest for circulation - and may consider other means of publishing this information. If the insolvency practitioner is appointed trustee or liquidator by the Secretary of State, they must give notice to the creditors individually or, if the court allows, by an advertisement. 5 the power to bring or defend legal actions relating to the property of the bankrupt or company; the power to come to a compromise with creditors of the bankrupt or company about their debts; the power to sell the property of the bankrupt for a sum of money payable in the future; and the power to mortgage the property of the bankrupt to raise money to pay the bankrupt's debts. The trustee or liquidator must tell the committee when they employ a solicitor to help them, or if they dispose of any property of the bankrupt or company to a person connected with that bankrupt or company. However, they do not need the committee's permission. If the trustee or liquidator has done something for which they require the committee's permission but did not get it beforehand, the committee may still approve what has been done. The committee should only approve if they are satisfied that the trustee or liquidator had to act as a matter of urgency and has since sought their approval without undue delay. If no committee is appointed, then the Secretary of State acts as the committee (in practice this will be the Insolvency Practitioner Unit of the Insolvency Service, acting on behalf of the Secretary of State). 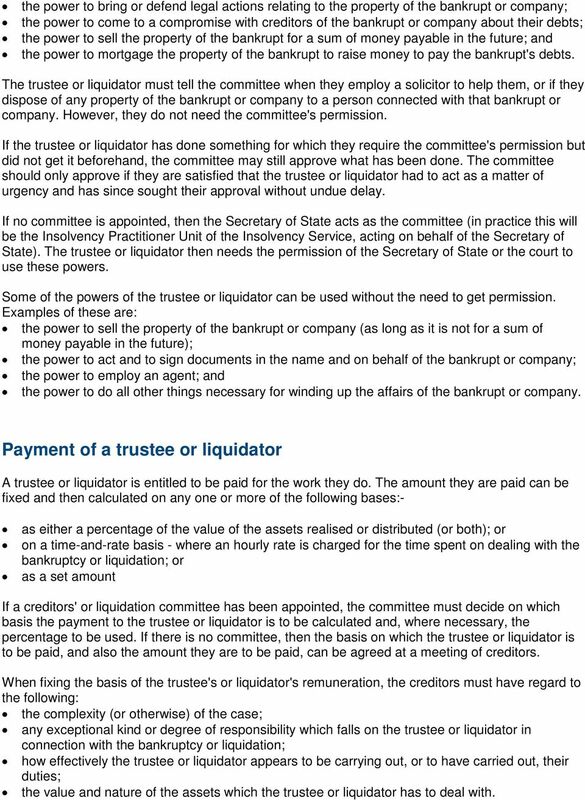 The trustee or liquidator then needs the permission of the Secretary of State or the court to use these powers. Some of the powers of the trustee or liquidator can be used without the need to get permission. Examples of these are: the power to sell the property of the bankrupt or company (as long as it is not for a sum of money payable in the future); the power to act and to sign documents in the name and on behalf of the bankrupt or company; the power to employ an agent; and the power to do all other things necessary for winding up the affairs of the bankrupt or company. Payment of a trustee or liquidator A trustee or liquidator is entitled to be paid for the work they do. The amount they are paid can be fixed and then calculated on any one or more of the following bases:- as either a percentage of the value of the assets realised or distributed (or both); or on a time-and-rate basis - where an hourly rate is charged for the time spent on dealing with the bankruptcy or liquidation; or as a set amount If a creditors' or liquidation committee has been appointed, the committee must decide on which basis the payment to the trustee or liquidator is to be calculated and, where necessary, the percentage to be used. If there is no committee, then the basis on which the trustee or liquidator is to be paid, and also the amount they are to be paid, can be agreed at a meeting of creditors. 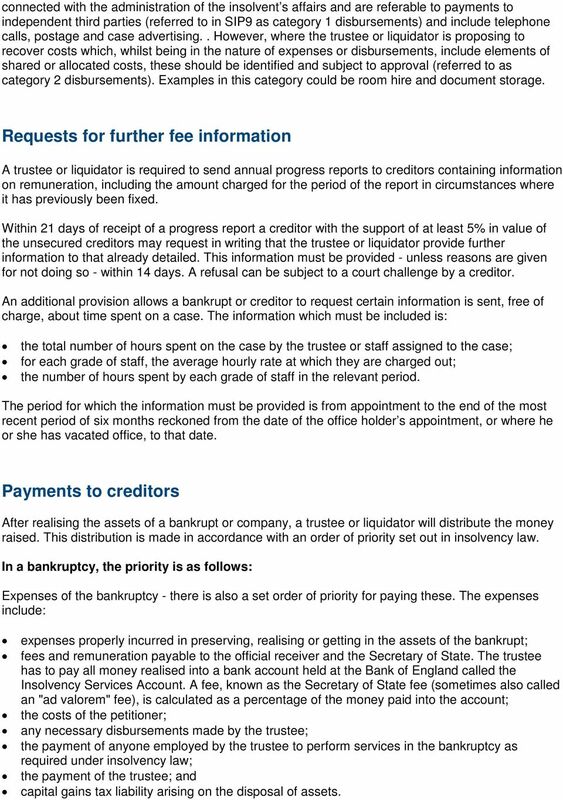 When fixing the basis of the trustee's or liquidator's remuneration, the creditors must have regard to the following: the complexity (or otherwise) of the case; any exceptional kind or degree of responsibility which falls on the trustee or liquidator in connection with the bankruptcy or liquidation; how effectively the trustee or liquidator appears to be carrying out, or to have carried out, their duties; the value and nature of the assets which the trustee or liquidator has to deal with. 7 connected with the administration of the insolvent s affairs and are referable to payments to independent third parties (referred to in SIP9 as category 1 disbursements) and include telephone calls, postage and case advertising.. However, where the trustee or liquidator is proposing to recover costs which, whilst being in the nature of expenses or disbursements, include elements of shared or allocated costs, these should be identified and subject to approval (referred to as category 2 disbursements). Examples in this category could be room hire and document storage. Requests for further fee information A trustee or liquidator is required to send annual progress reports to creditors containing information on remuneration, including the amount charged for the period of the report in circumstances where it has previously been fixed. Within 21 days of receipt of a progress report a creditor with the support of at least 5% in value of the unsecured creditors may request in writing that the trustee or liquidator provide further information to that already detailed. This information must be provided - unless reasons are given for not doing so - within 14 days. A refusal can be subject to a court challenge by a creditor. An additional provision allows a bankrupt or creditor to request certain information is sent, free of charge, about time spent on a case. The information which must be included is: the total number of hours spent on the case by the trustee or staff assigned to the case; for each grade of staff, the average hourly rate at which they are charged out; the number of hours spent by each grade of staff in the relevant period. The period for which the information must be provided is from appointment to the end of the most recent period of six months reckoned from the date of the office holder s appointment, or where he or she has vacated office, to that date. Payments to creditors After realising the assets of a bankrupt or company, a trustee or liquidator will distribute the money raised. This distribution is made in accordance with an order of priority set out in insolvency law. In a bankruptcy, the priority is as follows: Expenses of the bankruptcy - there is also a set order of priority for paying these. The expenses include: expenses properly incurred in preserving, realising or getting in the assets of the bankrupt; fees and remuneration payable to the official receiver and the Secretary of State. The trustee has to pay all money realised into a bank account held at the Bank of England called the Insolvency Services Account. A fee, known as the Secretary of State fee (sometimes also called an "ad valorem" fee), is calculated as a percentage of the money paid into the account; the costs of the petitioner; any necessary disbursements made by the trustee; the payment of anyone employed by the trustee to perform services in the bankruptcy as required under insolvency law; the payment of the trustee; and capital gains tax liability arising on the disposal of assets. 8 Claims of preferential creditors - these are defined in insolvency law and include, subject to limits, claims by employees for unpaid wages and holiday pay and certain contributions to occupational pension schemes. These are the first creditors to get paid. If insufficient money is realised to pay them in full, the money that is realised is paid to them in proportion to the amount they are owed. Debts which are neither preferential nor postponed (see below) - these are usually referred to as debts of unsecured creditors, who will include trade and expense creditors. If insufficient money is realised to pay them in full, the money that is realised is paid to them in proportion to the amount they are owed. This is described as a dividend of pence in the, where 100p in the equals payment in full. Interest on debts - if the debts of the preferential and unsecured creditors are paid in full, then they are entitled to interest on their debts from the date of the bankruptcy order. The rate of interest paid is the greater of: the statutory rate of interest at the date of the bankruptcy order, and the rate of interest the bankrupt would have had to pay if they had not been made bankrupt. Since 1 April 1993 the statutory rate of interest has been 8%. Debts to postponed creditors - these are defined in insolvency law, and include money owed to a person who was the spouse of the bankrupt at the date of the bankruptcy order. Surplus - if there is a surplus after paying in full all the expenses of the bankruptcy, all debts of the bankrupt and interest on the debts, then this money is returned to the bankrupt. Secured creditors - if a creditor holds a mortgage or charge over an asset of the bankrupt, then if that asset is sold the secured creditor receives the proceeds. If the debt owed to the secured creditor is paid in full from the proceeds, the trustee will receive the bankrupt's share of that surplus. Examples of secured creditors will be a bank or building society holding a life policy or a mortgage over a house. If the debt owed is not paid in full, the balance is an unsecured debt in the bankruptcy. In a liquidation the priority is as follows: Expenses of the liquidation - there is also a set order of priority for paying these. The expenses include: expenses properly incurred in preserving, realising or getting in the assets of the company; fees and remuneration payable to the official receiver and the Secretary of State. The liquidator has to pay all money realised into a bank account held at the Bank of England called the Insolvency Services Account. A fee known as the Secretary of State fee (sometimes also called the "ad valorem" fee) is calculated as a percentage of the money paid in to the account; the costs of the petitioner; any necessary disbursements made by the liquidator; the payment of any person employed by the liquidator to perform services in the liquidation as required under insolvency law; the payment of the liquidator; and corporation tax liability arising on the disposal of assets. Claims of preferential creditors - these are defined in insolvency law, and include, subject to limits, claims by employees for unpaid wages and holiday pay and certain contributions to occupational pension schemes. These are the first creditors to get paid. If not enough money is realised to pay them in full, the money that is realised is paid to them in proportion to the amount they are owed. 9 Floating charge - Instead of, or as well as, having a mortgage or charge over a specific asset(s) of the company, a creditor may have a mortgage or charge over the assets of the company generally. This is known as a "floating charge". From the proceeds of assets subject to a floating charge, preferential creditors will be paid first (to the extent that they have not already been paid from the company's general assets that are not subject to the charge). Where the charge was created on or after 15 September 2003, part of the proceeds from the sale of these assets will be set aside for distribution to unsecured creditors. Any surplus will be paid to the secured creditor holding the floating charge. 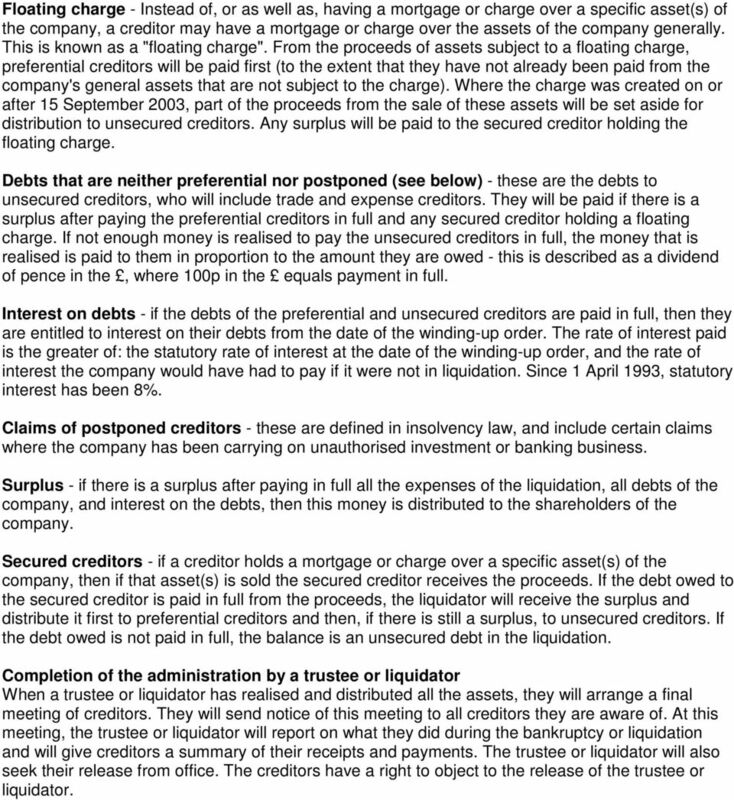 Debts that are neither preferential nor postponed (see below) - these are the debts to unsecured creditors, who will include trade and expense creditors. They will be paid if there is a surplus after paying the preferential creditors in full and any secured creditor holding a floating charge. If not enough money is realised to pay the unsecured creditors in full, the money that is realised is paid to them in proportion to the amount they are owed - this is described as a dividend of pence in the, where 100p in the equals payment in full. Interest on debts - if the debts of the preferential and unsecured creditors are paid in full, then they are entitled to interest on their debts from the date of the winding-up order. The rate of interest paid is the greater of: the statutory rate of interest at the date of the winding-up order, and the rate of interest the company would have had to pay if it were not in liquidation. Since 1 April 1993, statutory interest has been 8%. Claims of postponed creditors - these are defined in insolvency law, and include certain claims where the company has been carrying on unauthorised investment or banking business. Surplus - if there is a surplus after paying in full all the expenses of the liquidation, all debts of the company, and interest on the debts, then this money is distributed to the shareholders of the company. Secured creditors - if a creditor holds a mortgage or charge over a specific asset(s) of the company, then if that asset(s) is sold the secured creditor receives the proceeds. If the debt owed to the secured creditor is paid in full from the proceeds, the liquidator will receive the surplus and distribute it first to preferential creditors and then, if there is still a surplus, to unsecured creditors. If the debt owed is not paid in full, the balance is an unsecured debt in the liquidation. Completion of the administration by a trustee or liquidator When a trustee or liquidator has realised and distributed all the assets, they will arrange a final meeting of creditors. They will send notice of this meeting to all creditors they are aware of. At this meeting, the trustee or liquidator will report on what they did during the bankruptcy or liquidation and will give creditors a summary of their receipts and payments. The trustee or liquidator will also seek their release from office. The creditors have a right to object to the release of the trustee or liquidator. 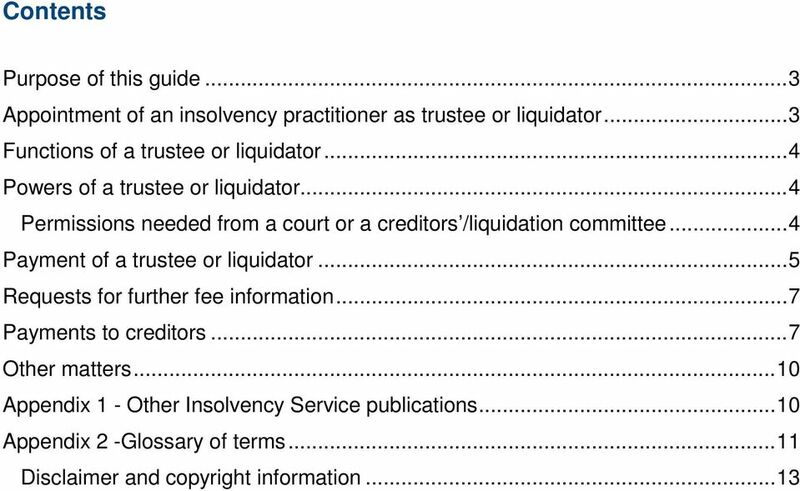 10 Other matters If you are the bankrupt or company officer (both current and former): You have a duty to co-operate with the trustee or liquidator. This is in addition to your duty to cooperate with the official receiver. How do I complain about the actions of a trustee or liquidator? Bankruptcy and compulsory liquidation (winding-up) are court procedures, so a trustee or liquidator is subject to the control of the court. The Insolvency Act 1986 enables bankrupts, creditors, directors or contributories to ask the court to intervene, and gives the court wide-ranging powers. If you wish to complain about an insolvency practitioner's unprofessional conduct, you should contact the Complaints Gateway. 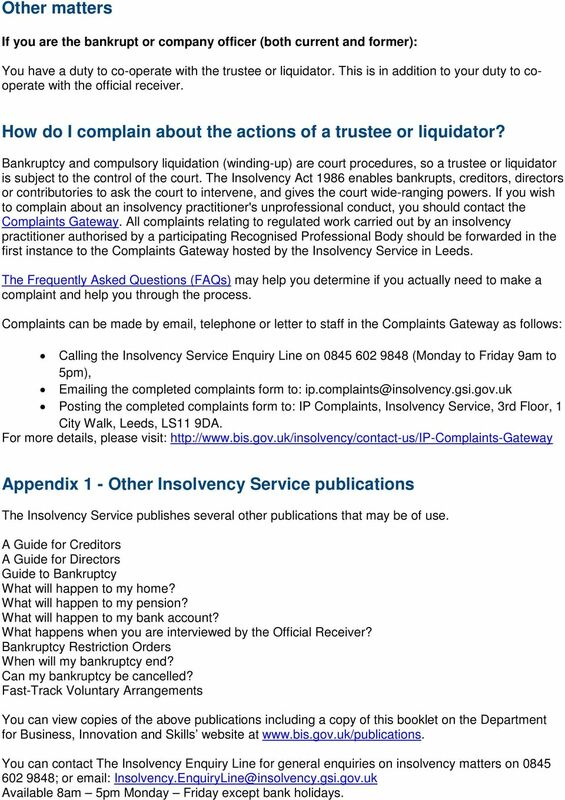 All complaints relating to regulated work carried out by an insolvency practitioner authorised by a participating Recognised Professional Body should be forwarded in the first instance to the Complaints Gateway hosted by the Insolvency Service in Leeds. The Frequently Asked Questions (FAQs) may help you determine if you actually need to make a complaint and help you through the process. Complaints can be made by , telephone or letter to staff in the Complaints Gateway as follows: Calling the Insolvency Service Enquiry Line on (Monday to Friday 9am to 5pm), ing the completed complaints form to: Posting the completed complaints form to: IP Complaints, Insolvency Service, 3rd Floor, 1 City Walk, Leeds, LS11 9DA. 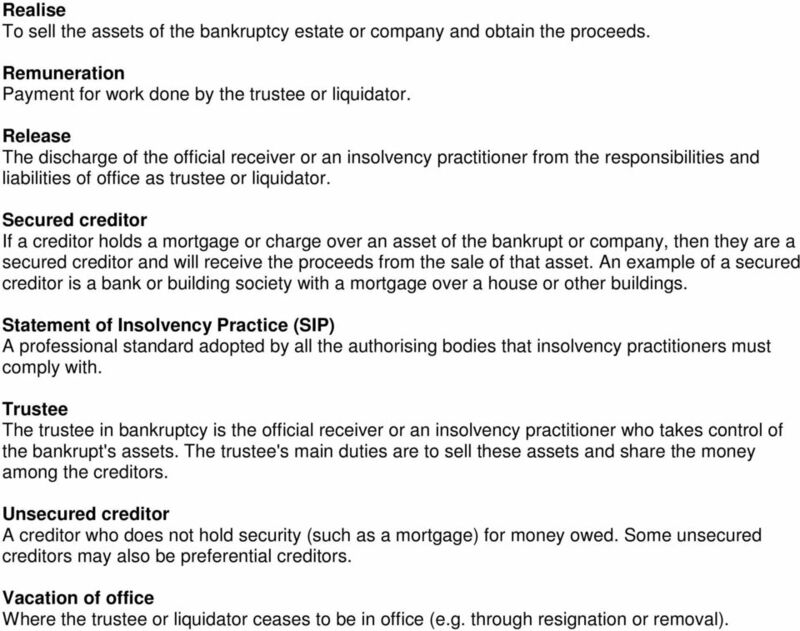 For more details, please visit: Appendix 1 - Other Insolvency Service publications The Insolvency Service publishes several other publications that may be of use. A Guide for Creditors A Guide for Directors Guide to Bankruptcy What will happen to my home? What will happen to my pension? What will happen to my bank account? What happens when you are interviewed by the Official Receiver? Bankruptcy Restriction Orders When will my bankruptcy end? Can my bankruptcy be cancelled? Fast-Track Voluntary Arrangements You can view copies of the above publications including a copy of this booklet on the Department for Business, Innovation and Skills website at You can contact The Insolvency Enquiry Line for general enquiries on insolvency matters on ; or Available 8am 5pm Monday Friday except bank holidays. 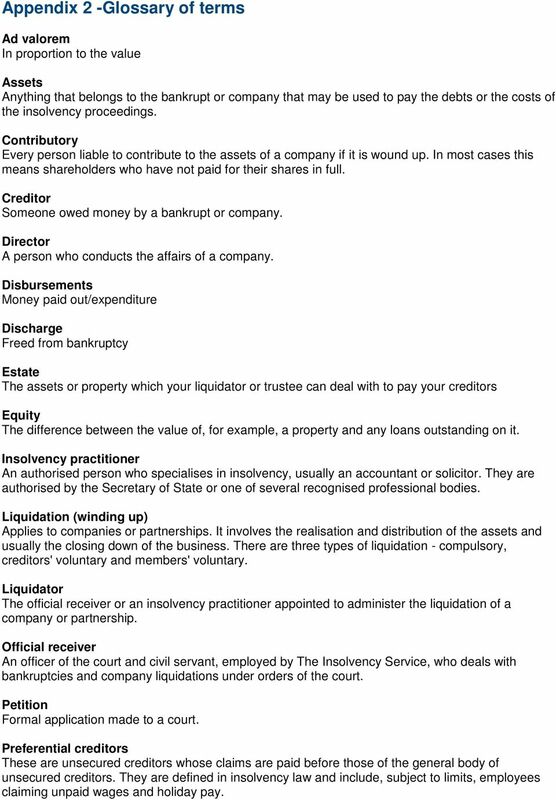 11 Appendix 2 -Glossary of terms Ad valorem In proportion to the value Assets Anything that belongs to the bankrupt or company that may be used to pay the debts or the costs of the insolvency proceedings. Contributory Every person liable to contribute to the assets of a company if it is wound up. In most cases this means shareholders who have not paid for their shares in full. Creditor Someone owed money by a bankrupt or company. Director A person who conducts the affairs of a company. Disbursements Money paid out/expenditure Discharge Freed from bankruptcy Estate The assets or property which your liquidator or trustee can deal with to pay your creditors Equity The difference between the value of, for example, a property and any loans outstanding on it. Insolvency practitioner An authorised person who specialises in insolvency, usually an accountant or solicitor. They are authorised by the Secretary of State or one of several recognised professional bodies. Liquidation (winding up) Applies to companies or partnerships. It involves the realisation and distribution of the assets and usually the closing down of the business. 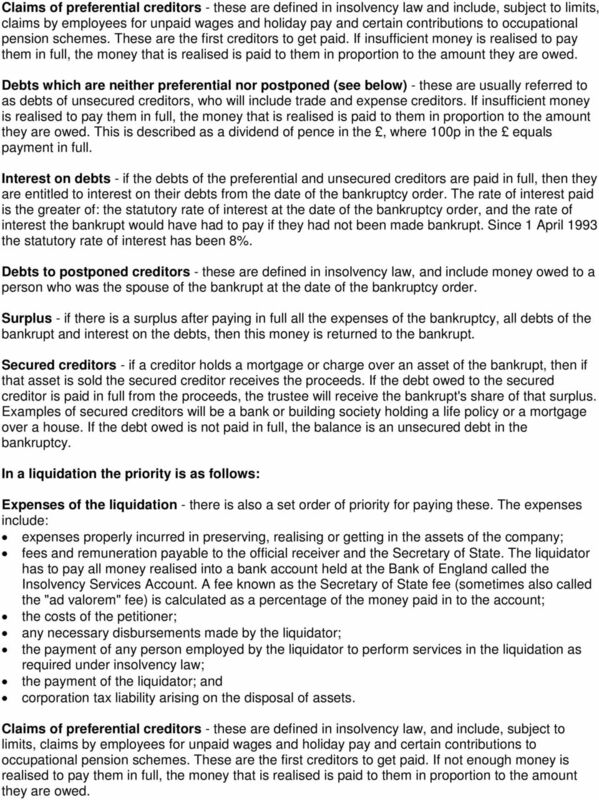 There are three types of liquidation - compulsory, creditors' voluntary and members' voluntary. Liquidator The official receiver or an insolvency practitioner appointed to administer the liquidation of a company or partnership. Official receiver An officer of the court and civil servant, employed by The Insolvency Service, who deals with bankruptcies and company liquidations under orders of the court. Petition Formal application made to a court. Preferential creditors These are unsecured creditors whose claims are paid before those of the general body of unsecured creditors. They are defined in insolvency law and include, subject to limits, employees claiming unpaid wages and holiday pay. 12 Realise To sell the assets of the bankruptcy estate or company and obtain the proceeds. 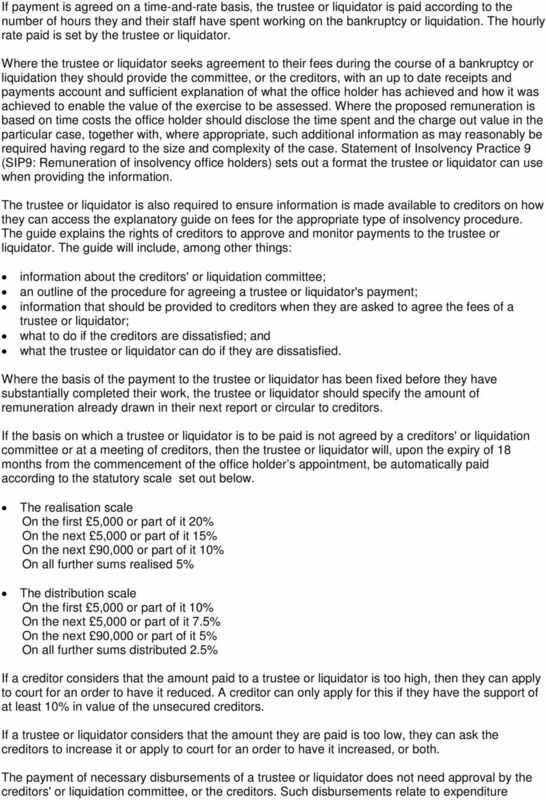 Remuneration Payment for work done by the trustee or liquidator. Release The discharge of the official receiver or an insolvency practitioner from the responsibilities and liabilities of office as trustee or liquidator. Secured creditor If a creditor holds a mortgage or charge over an asset of the bankrupt or company, then they are a secured creditor and will receive the proceeds from the sale of that asset. An example of a secured creditor is a bank or building society with a mortgage over a house or other buildings. Statement of Insolvency Practice (SIP) A professional standard adopted by all the authorising bodies that insolvency practitioners must comply with. Trustee The trustee in bankruptcy is the official receiver or an insolvency practitioner who takes control of the bankrupt's assets. The trustee's main duties are to sell these assets and share the money among the creditors. Unsecured creditor A creditor who does not hold security (such as a mortgage) for money owed. Some unsecured creditors may also be preferential creditors. Vacation of office Where the trustee or liquidator ceases to be in office (e.g. through resignation or removal).